SDC summer building hours will be in effect Sunday, May 3 through Saturday, August 22. Remember the annual steam shutdown will be May 3-7, with no hot water available. New this summer is public skating, see the summer schedule for dates. Summer public skating will be offered free to SDC members and Michigan Tech students. Purchasing a SDC day pass this summer will include public skating, or for those only wanting to skate, a $3 skating pass will be available at the SDC ticket office. Returning this summer is adult lap swim on week days from 1:30-2:30 p.m. Enjoy your summer and Commit to be HuskiesFit! 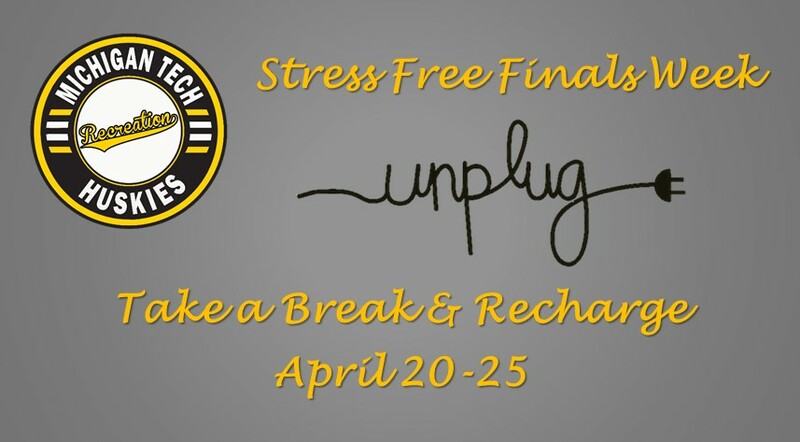 Take a break, unplug and recharge with a free fitness class the week of April 20-25! Print out the free class flyer and bring it to any (1) fitness class at the SDC the week of April 20-25. Come early. Classes are first come first serve, based on availability. Commit to be “HuskiesFit” in 2015! Step It Up with Step Boxing! It’s time to step it up with Step Boxing! A 3-week series begins this Sunday, April 12. Step boxing combines kickboxing and step aerobics to create a really fun, intense workout. Class meets Sunday, 5:00-5:50 p.m. in the SDC Studio. 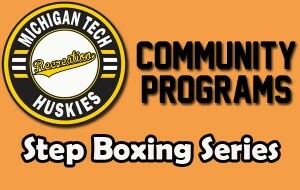 Cost to attend is $15/community member for the series, $12/Michigan Tech student for the series or $7 daily. For more information or to register, visit Step Boxing. Commit to be “HuskiesFit” in 2015 with Michigan Tech Recreation! The Michigan Tech Men’s Basketball Coaches and Team will be hosting a Little Huskies camp for boys in grades 2-6 April 20-23. Cost to attend is $40/person, $20/sibling. Deadline to register is Friday, April 10. 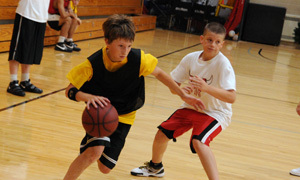 For more information, visit Boys’ Basketball Little Huskies Camp. Bounce, jump, run & play with the Michigan Tech Huskies at Bounce-O-Rama! This Make-A-Wish fundraiser event, hosted by the Michigan Tech Student-Athlete Advisory Committee, will take place Sunday, April 12, from 12:00-5:00 pm in the SDC Gym. Pre-sale tickets are available until April 11 for $8 at the SDC Ticket Office. $10 at the door. The SDC will be closed on Easter Sunday, April 5. HOUGHTON, Mich. – The Michigan Tech athletic training staff is holding an Athletic Training Clinic on Saturday, April 18 from 9:30 a.m. – 3 p.m. The clinic will teach kids grades 9-12 the athletic training profession. Preregistration is required by April 17 and cost is $35. The clinic will include educational sessions on what an athletic trainer does as far as injury assessment, injury treatment, taping, stretching and sports medicine. There will also be a question and answer session with current Tech student-athletes and athletic training students. The annual spring football game is scheduled for that day as well with an opportunity for participants to work alongside current athletic trainers during the game. The clinic includes lunch, an athletic training kit and prizes. Register online at MichiganTechRecreation.com or by calling 906-487-2073. Full payment and a signed waiver release is required. For more information call 906-483-1847 or email mogino@mtu.edu.